It is with great sadness that we announce the unexpected death of Richard Clark last night (29/1/11). Richard began gliding in 2008 after the death of his wife, and he soon established himself in the life of the club, flying mainly midweek. He made rapid progress and ended the season by joining the club’s expedition to Aboyne, where the view of Braemar from 14,500ft converted him to wave flying and the annual trip to Scotland. The following spring he spent two weeks in Cerdanya, Spanish Pyrenees with the club expedition, exploring mountain flying, and he was looking forward to the Serres expedition this coming June. 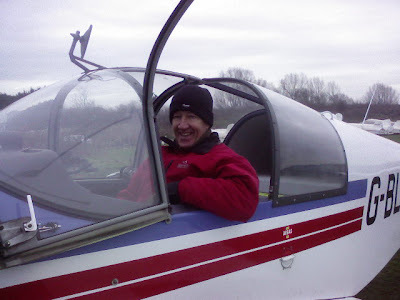 He was also a budding cross country pilot, having gained his silver distance in April 2010. He had recently bought an ASW20, sadly he had yet to fly it. As well as his flying, he was a stalwart member of the Sales and Marketing Team, always the first to volunteer for events. Quiet and unassuming, he ‘got on with it’ with the minimum of fuss, and proved to be an excellent salesman and promoter of gliding. For his presence both on and off the airfield, he will be greatly missed. In October a BBC Radio 4 Science team were at Booker making a radio documentary on the atmosphere ‘Thin Air’. The first of a three part series is due to be broadcast tomorrow Wednesday 12 January at 21.00. A busy day today with an Aerobatics course and the first of the Bronze C lectures of 2011 jostling for position in the briefing room first thing before the arrival of a sofa overtook events. The door wasn't big enough and it required the windows to come out. It was interesting to see that the ratio of onlookers to anyone doing anything useful was only just a point or two off the glide ratio of a standard class glider. Fortunately the weather cleared after the front went through and the practical side of the Aerobatics course was able to take advantage of the sunshine and fabulous clear skies. 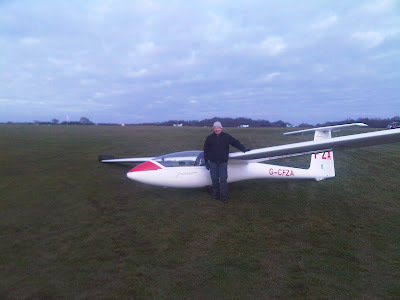 Happy New Year to all Booker Gliding Club Members and readers of this Blog - hear's wishing you all safe and enjoyable soaring in 2011. 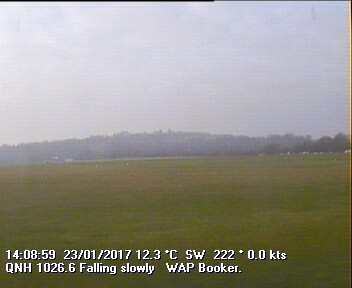 The first flyable day of 2011 has been a good one with 20 launches taking place throughout the day being a mix of training, aerobatic and single seater flying. Rumour was that there was some lift about, not enough to climb in but good enough to extend the time soaring. After much haggling the honour of the first launch of 2011 went to Symeon Economou in FZA but David Baker's first solo in EBZ eclipsed that. Congratulations to David - we look forward to seeing him (and the other recently solo pilots) progressing during 2011. Symeon Economou 'guarding' FZA to ensure he was first to fly!